The match of the day in the South of Scotland League lived up to its name last Saturday when Newton Stewart locked horns with the unbeaten Lochar Thistle at Blairmount Park. The home side having lost their own unbeaten record in midweek to Stranraer took the initiative in this contest right from the start. It only took six minutes for Ross McCrindle to find the net followed by a Johnny Fisher header 11 minutes later. In the 23rd minute striker Robert Middleton made it three to give the Creesiders a comfortable lead to take into the break. Lochar started the second half seemingly intent on forcing their way back into the match and 12 minutes after the restart a Ross Woodward header gave the visitors a lifeline. Good defensive work however by Newton kept an eager Lochar team at bay and before the end a twenty yard shot from the home sides Ryan Mckie came off the crossbar and into the net via a Lochar defender to complete the scoring. 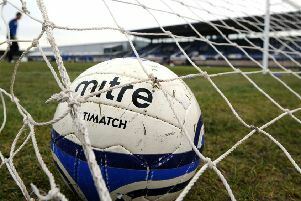 Heston Rovers also bounced back to take the three points from their match against Threave Rovers at Palmerston Park in a good 3-0 victory. Kieran Mckie scored a double in the 15th and 81st minutes with Jamie Struthers ensuring a win with four minutes left to play. Upper Annandale continued their good run of form when they disposed of Dumfries YMCA in a fairly close match at Moffat running out winners by 4-0. Sean Peat scored a double for the visitors with Dean Richardson scoring a hat trick for the home side to add to a single from Swift. St Cuthbert Wanderers woes continued when they were held at home in a one all draw against Lochmaben with an own goal by the visitors separating the teams at the break before Lochmaben levelled the match in the second half. Mid Annandale recorded a decisive 4-0 victory against Creetown at Lockerbie while Bonnyton Thistle continued their good start to the season with a six goals to three victory over the young Annan Athletic side. Stranraer were two one up at half time against Abbey Vale at Stair Park but went down by the odd goal in seven with Vale’s goals coming from Andy Gilston, Ross Green, Brodie Turner and Curtis Telfer.